London, August 1977. Darcus Howe, a British civil liberties activist, is standing on top of a toilet block with a megaphone in his hand. A group of serious-looking young men stand alongside Howe, and a dense crowd surrounds the toilet block stage. This is a big counter-demo for a march organised by the National Front, and a mixed group of Londoners has arrived to protest against racism. 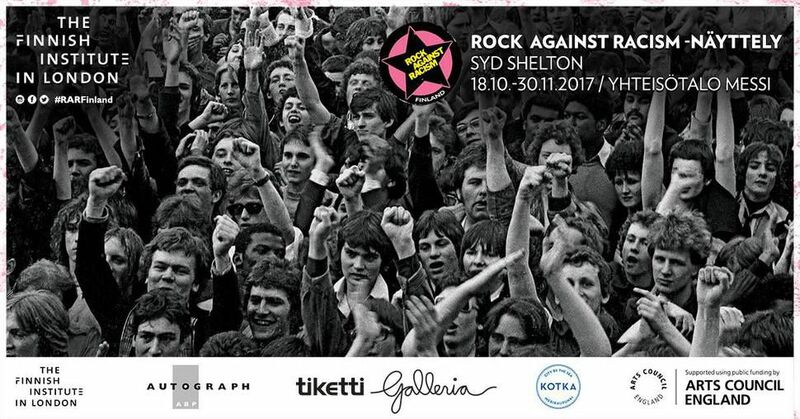 This photograph, and a number of others can be seen at the Messi communal building in Kotka, Finland, between 17 October and 30 November as a part of Syd Shelton’s exhibition Rock Against Racism. Rock Against Racism was an influential social campaign in the UK between 1976-1981. The movement consisted of musicians, artists and political activists, who criticised and confronted various forms of racism in the society through music. Photographer Syd Shelton (b. 1947, UK) captured the different stages of the movement through his photography, which he called “graphic arguments”. Rock Against Racism is curated by Mark Sealy at Autograph ABP and Professor Carol Tulloch, University of the Arts London. The exhibition has been brought to Kotka in cooperation with Tiketti Gallery and the Finnish Institute in London. The Institute, with its Finnish and British partners, has brought the exhibition to Finland twice before, to Helsinki and to Joensuu in Eastern Finland. The youth work department of the city of Kotka wants to take part in supporting integration, fighting against racism and preventing hate speech. The Messi venue, which will serve as the exhibition space for Rock Against Racism, is a communal space aimed for the youth of the city. The youth work department organises events and open nights at Messi, and around 20 other organisations, open groups and other actors also use the venue. Admission is free to the exhibition.